William I. McFarlane, birth date 4/10/1869, death date 10/2/1938. FamilySearch Texas Deaths, 1890-1976. 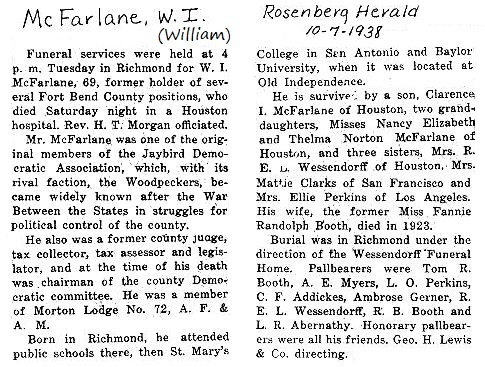 Obituary, Rosenberg Herald, 10/7/1938. Fort Bend County Libraries Obituaries Database. Description of the Jaybird-Woodpecker War, including an account of W.I. McFarlane's indictment for the murder of Kyle Terry, pp. 191-221, Wharton's History of Fort Bend County. HeritageQuest Online.